What Is the GoPro Video Format and Codec for 4K Shootings? What video format/codec does GoPro HERO action camera use to record 4K video? Influenced by 4K rising in popularity, action camera maker GoPro jumped on the wave in 2012 with the 4K-capable Hero 3 Black Edition. This camera can shoot at up to 3840x2160 pixels at 15 frames per second. GoPro action cameras that support 4K video shooting have been rounded up in the list below. Well, what video format does GoPro use for 4K shootings? What're the features of GoPro's 4K video file format? We'll get to the answer in the next part. * Convert GoPro 4K video format, such as HEVC to H.264 and H.264 to HEVC, to solve GoPro video not supported issue. * Compress Gopro 4K video by changing file format, lowering resolution (i.e., 4K to 1080P), bit rate, etc. * Crop, trim, merge, rotate, subtitle Gopro videos. Add special effects. Add text or image watermark. * Free download GoPro 4K videos from YouTube and the like (500+ sites supported). * Super fast speed thanks to AMD, Intel QSV- and NVIDIA CUDA/NVENC-accelerated hardware decoding, processing, encoding, and supporting MMX-SSE, Hyper-threading and AMD 3DNow! tech. 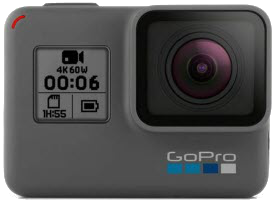 Except for HERO6 Black, all 4K-capable GoPro HERO cameras use the H.264 codec wrapped by MP4. The HERO6 Black still employs MP4 as the container format for all of its video files, but the video codec is no longer limited to H.264. Highest-end video modes including 4K at 60 FPS, 4K at 50 FPS, and 4K 4:3 at 24/25/30 FPS use H.265 (aka.HEVC) - a newer and more efficient video compression standard. What CODEC is used when the GOPRO HERO 4 Black is recording a video file in the .MP4 format? My new VIZIO 4K UHD TV will not play GOPRO videos... I get the message "unsupported video format". VIZIO rep says they support the play back of .MP4 videos just not the CODEC that GO PRO uses. How do we fix this? I just bought new Hero 6, and the 4k 60fps files aren't viewable after I import into FCP, Adobe Premiere or Quick. All are using most updated versions. Just see a black screen and can hear audio. 1. Your device should meet the minimum system requirements for GoPro 4K video playback and editing. 2. Transfer your GoPro 4K videos from SD card to computer's hard drive before playback. Otherwise, you may find the GoPro video is choppy. 3. Make use of a 4K-compatible video player like 5KPlayer and VLC. Windows Media Player isn't recommended because it isn't powerful enough to handle ultra-high-definition video. 4. If your GoPro 4K video is encoded with HEVC, make sure the device and the software you use supports HEVC. 5. Ultimate solution - compress or convert your GoPro 4K videos. This way can solve problems like GoPro video format not supported, high bitrate 4K GoPro video not compatible with your player, etc. If you don't have a program to perform video compressing and converting, you can try excellent WinX HD Video Converter Deluxe. It is available to convert your GoPro 4K videos in HEVC format to H.264 or others, compress GoPro HEVC or H.264 4K video to 1080P, 720P, etc, for uploading to YouTube/Facebook, playback/editing on legacy PC/Mac, iPhone, iPad, Android Samsung Galaxy S9/S8, Xbox One, PS4, etc. A user guide is attached below to help convert/compress GoPro 4K HEVC/AVC videos. 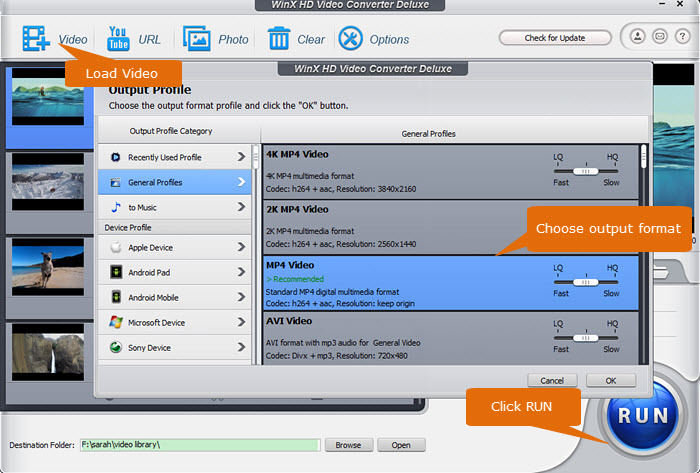 To get started, download and install WinX HD Video Converter Deluxe on your computer. This program comes with two versions, Window edition compatible with Windows 10 and lower while Mac supporting macOS Mojave and lower. Now open this tool and do what we tell you below. Step 1. Load the GoPro 4K videos you want to convert or shrink. First of all, click Video to access Video Processing tool. Next, you simply need to drag and drop target files into the screen or click the + Video button on the top toolbar to browse and select them. WinX HD Video Converter Deluxe offers hundreds of optimized output profiles that can cover almost all of your needs. It allows you to change GoPro 4K video format from AVC (H.264) to HEVC (H.265), from HEVC (H.265) to AVC (H.264), or choose a profile fit for your device (i.e., iPhone X, Samsung Galaxy S8), software (i.e., iTunes, iMovie, Final Cut Pro), website (i.e., YouTube, Facebook), etc. Step 3. Edit your GoPro video. ▶ Click the Option icon, and then you can tweak video audio parameters, such as video resolution, bit rate, and frame rate. ▶ Besides, you can crop and trim off unwanted part to resize video, rotate your videos, add special effects, adjust brightness, contrast, add watermark, etc. Step 4. Begin converting/compressing GoPro 4K video. Intel QSV, NVIDIA CUDA/NVENC and AMD based hardware decoding, processing and encoding will be enabled automatically if there's supported GPU. Hardware acceleration can give a great boost on speed. Speed doesn't come at the expense of video quality. Certainly, you can also disable it based on your own needs. In the end, simply click RUN button to get GoPro 4K video conversion/compression started. With WinX HD Video Converter Deluxe, you can reduce the file size of GoPro 4K videos and other sources and change the video format of Gopro 4K video, to make your video recordings easily imported to anywhere you'd love to.